The impressed “NEALE & CO” mark, probably used from around 1780. The “& CO” may reflects the financial involvement of one or more of Neale’s London partners—and possibly Robert Wilson too-- in the Church Works. Impressed “G” with an impressed crown above. This mark could indicate any point in the Wilson period of 1792-1816. We do not know if David Wilson continued using the mark used by his brother, or whether he simply ceased marking his wares. Note a weakly impressed "G" may appear as a "C."
Note that these two marks occur together on wares, and possibly on as-yet-undocumented figures. This combined marking reflects Wilson’s formal “CoPartnership” with Neale and may have been used between 1783 and 1792. Also, “WILSON” is impressed in wares, sometimes with the impressed “G” and crown. Note that this manufactory impressed the identity of some figures beneath the base. This marking is not found on larger figures, but occurs frequently on smaller figures. In particular, Apollo, Ceres, Spring, Summer, Autumn, and WInter are marked thus. Marked WIlson figure shows impressed G with crown, and SPRING . 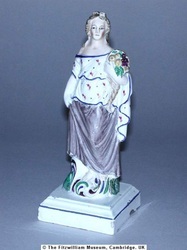 A stepped square base, edged in pink or puce, is the form most routinely found on small figures marked for either Neale or Wilson. The line on the base may vary in its placement, sometimes being at the top of the stepped area, other times at the bottom. Figures marked WILSON occur with a blue line. 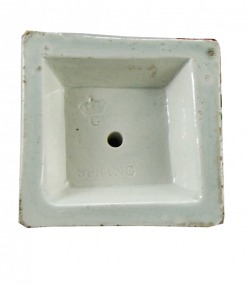 When the base is square, an earthenware pad atop it usually supports the figure. 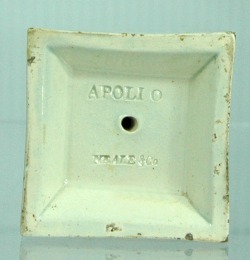 Small figures (Apollo, Ceres, figures depicting the Seasons) customarily encompass rococco scrolls atop the square base. The scrolls are painted in a palette that we think of as typically 'Neale": turquoise and puce dominate. Neale & Co figures are particularly refined. The molds are crisply detailed. The glaze is not heavy and has a silky sheen. The enamels are exceptionally pretty and delicate and are applied with meticulous attention to detail. 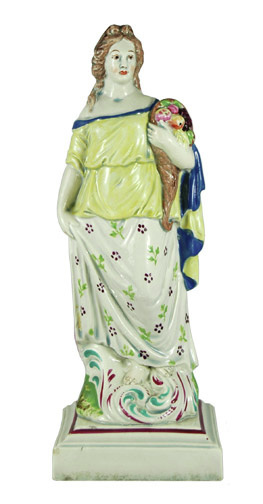 At their finest, Neale enamels are unsurpassed by those of any other Potteries manufacturer. The color palette routinely uses a pretty turquoise coupled with shades of pink and puce. The six Wilson figure forms that we have recorded are all small and very like their Neale counterparts, including having their titles impressed beneath the bases. The Neale figure of Summer always seems to have a black dot painted on the hat brim; Wilson and unmarked figures lack this feature. It is virtually impossible to attribute a figure to Neale or Wilson in the absence of a mark because Neale and Wilson figures are formed from the same molds and decorated similarly. These very similar figures of Ceres all are almost certainly the output of the Church Works. Center: Impressed G with a crown and CERES. Fitzwilliam Museum, Cambridge. Right: Impressed CERES with no maker's mark.